Three people are facing charges for stealing a car and leading Collier County deputies on a high-speed chase early Monday morning. 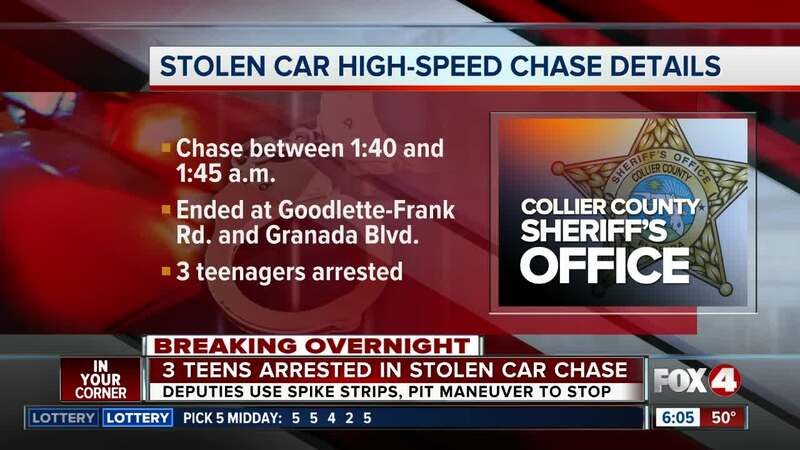 COLLIER COUNTY, Fla. -- Three people are facing charges for stealing a car and leading Collier County deputies on a high-speed chase early Monday morning. It happened around 1:40 a.m. in Naples. Deputies tell us the chase lasted for about 5 minutes and ended at the corner of Goodlette-Frank Road and Granada Boulevard. Deputies say they used spike strips to bust the car thieves' tires, then used a PIT maneuver to bring them to a full stop. The three occupants, who are minors, then surrendered to deputies.